I was never a big breakfast eater when I was younger. My mother was lucky to get me to drink a Carnations Instant Breakfast as I was running out the door to school. Even on the weekends when I did eat breakfast, grits never made it to our table. The few times that I did eat grits, they were usually plainly prepared with salt and maybe a little butter. I didn’t hate them, but I found them to be bland and boring. It wasn’t until many years later with the rebirth of grits doctored up with cheese and butter that I developed more of appreciation for them. Seriously, don’t cheese and butter make anything better? As nouveau southern cuisine swept the country, chefs began using grits in many different variations. They’re a little like a blank canvas and many varied ingredients can elevate them to a mouthwatering side. Sweet potatoes, on the other hand, were a staple in our house. Vardaman, Mississippi, a nearby town and the self-proclaimed sweet potato capital of the world, produced some of the best tubers I’ve ever eaten. As a child, I could make a meal on baked sweet potatoes slathered in butter. Today’s post features my version of sweet potato grits that I serve with pan seared scallops and chanterelle mushrooms. Sweet potatoes and autumn are synonymous in my book and this dish exemplifies delectable fall fare. 1. Heat olive oil in a medium pot. Add shallots, sage, and thyme. Saute for one minute. 2. Add chicken stock and bring to boil. Slowly add corn meal, whisking constantly until well combined. Add sweet potato and continue whisking until incorporated. Reduce heat to simmer. 3. Add salt and pepper and cook for 10 to 15 minutes, whisking regularly. You'll want the texture to hold its shape when placed on the plate. 4. Add maple syrup, cream, Parmesan cheese, and butter. Whisk until cheese and butter are melted. Remove from heat. Adjust salt and pepper to taste. If texture becomes too thick, add chicken stock at little at a time until you have the proper consistency. Heat olive oil in a medium skillet. Add mushrooms, thyme, and salt. Saute for 4 to 6 minutes or until lightly browned and tender. 1. Dry scallops with paper towel and season with salt on both sides. 2. Heat olive oil and butter in a large non-stick or cast iron skillet over medium high heat. Add scallops to the skillet without overcrowding. Cook undisturbed for 3 minutes. Turn the scallops and cook for 3 minutes. Remove from skillet. 3. 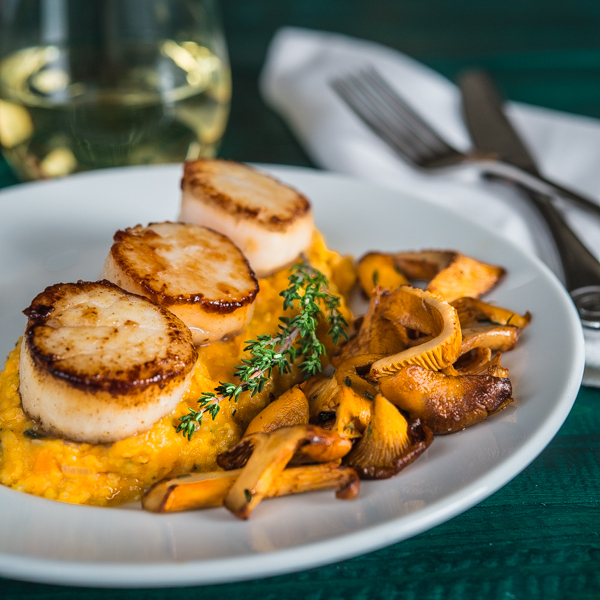 Serve three scallops per person with sweet potato grits and mushrooms. Hello Bill – this was a fabulous recipe! Can I freeze the grits? It is just my husband and I, so we have a lot left over. Saw this online and had to try it. All 4 of us devoured this dish made as printed (though we brined the scallops like thomas keller). It was great. Talked about going sans scallop for vegetarian meals. Or adding lardon of some sort to any of the 3 items. Decided we would try the grits all sorts of ways some other time – they were great. Sub butternut squash for sweet potato. Sub ricotta for parmesan. Etc. Also suggest most any white fish would work. Chicken Saltimbocca as protein or even rotisserie chicken. I was very happily surprised by the grits with sweet potato. Thanks for the recipe. Thanks so much for the feedback, Melissa! I always enjoy hearing how my recipes work out for other people. I really appreciate your visit to Southern Boy Dishes and I hope you come back soon! Wow – Bill those sweet potato grits alone would have made me happy! Throw in scallops and …. BLISS! I can’t think of three better things to go together in a fall dish! Or maybe four if you count sweet potatoes and grits separately. Love the idea and it looks absolutely delicious! For me, the highlight of this meal is the sweet potato grits. 🙂 I definitely need to make those! Even though I love scallops, they are so hard to find here. Some times I can find them frozen, but if they are fresh…we’re talking over $20/pound! Lovely meal and what a great side! My mouth literally started watering as I read this post. Your photography is stunning! I am blown away really:) I grew up in the North East but with a mom from Texas, we had grits for breakfast a lot. I too love the cheese grits. Adding sweet potatoes and chanterelles, oh my! Now you’re talkin’. Cornmeal and sweet potato featuring grits idea is an excellent one! This does looks absolutely gorgeous. A beautiful and fancy looking plate. Hubby loves scallops, sounds very interesting with the potato grits. FANCY. Love the combination of flavors in this dish. Beautiful photo too! This looks spectacular! I love the idea of sweet potato grits. In fact I love sweet potato anything, but never thought to combine them with grits. Trust me, I will. 😉 Superb stuff – thanks so much. This may just be the most gorgeous scallops ever!